Paramontante by Juan Salvadoriof CZwings. English translation. LIFT is tracking the explorations project termed Paramontante by Juan Salvadori of Argentina. We have asked that Juan Salvadori of CZwings enter primary data in his first language; our translations to other languages is a secondary project. Discussion is invited: Editor@UpperWindpower.com The general concern direction in Juan Salvadori's focus has also been part of discussions by others such as researcher developer Brett Snellgrove and Pere H. Casellas of Laboratori d'envol, and others; their contributions are invited to this folder. We invite expert translations to other languages; thanks: English, German, Chinese, Japanese, French, Russian, ... and more. Are there some final formats within or near the Paramontante that will benefit foot-launched gliding? 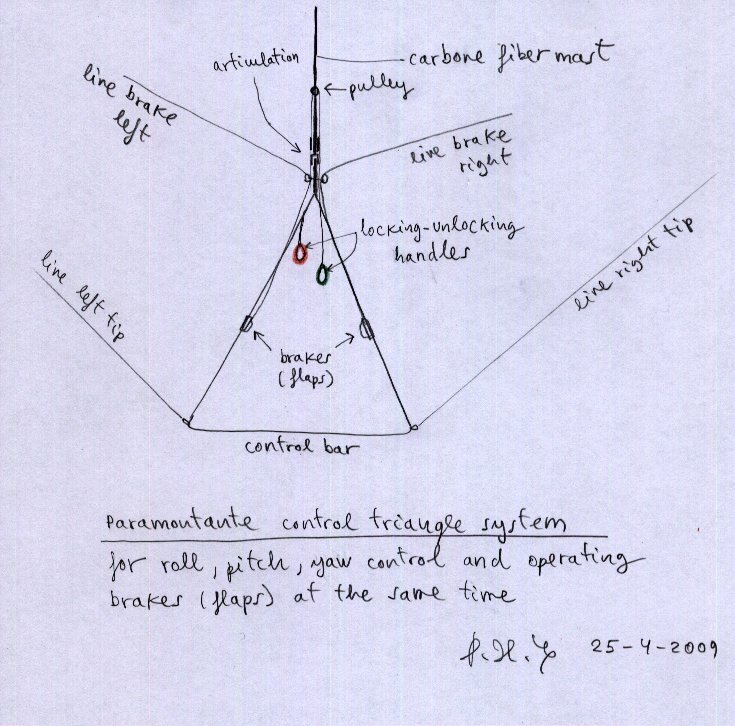 In February of 2000 I did the PARAMONTANTE in order to minimize risk in folded. After having analyzed several possible methods such as profiles reflex rigid stringers inside the wing floating devices in the bands that rolled suspentaje when the wing folded avoiding ties, extra mouths that opened with the valves folding wing, rigid rod edge , inflatable elements similar to those used in kitesurfing, etc, etc. But always there was the specter of falling into the candle as happened so often claimed the lives of several pilots ... enough to make a profound loss with the glider and drop command at the wrong time to be a serious problem!. A day off with my glider trailer for a few meters above the ground and in good climb (while my vehicle traction) I had a very large folded, I was not sure the gliders in the folded attitude climb but I was wrong ... the folded can come anytime and with any glider. At that moment I understood that in spite of doing things very well and with care, the glider can take away life in an instant, and even though it is not common so I happened to me, it can happen. Then I felt envious of the other aircraft in free flight (Hang Gliders, Gliders Rigids etc.) Turbulence that can fly without major risks, but had learned to enjoy the simplicity, comfort and freedom of paragliding. At that moment I understood that the paraglider had to find a way to fly safe and that while some performance was lost, it would be worth ... or better to say "good life". My first paraglider plans fell almost 3:1 and 2 meters per second, but had already planned to 9:1 gliders so that it could lose some performance and still be well above the 3:1 for my first glider. I also learned that with an aircraft (Paraglider, Hang Glider or Paramontante) which has a glide of 8:1, the minimum rate of decrease of 1.2 m/s, 25 km / h and 50 km minimum speed / maximum speed, it is possible fly to sail without any problem and enjoy it. So if you became a good gliding performance Paramontante, the aircraft would be ideal: light, practical, strong (8 G), simple to fly, transportable and can despeque almost anywhere. 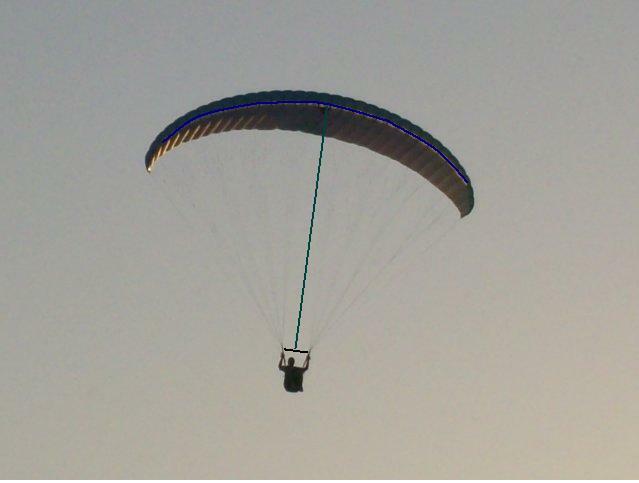 It is a paraglider with a crossbar on the nose of the profile and in an amount that the pilot begins and ends in the middle of the crossbar, allowing the specification paragliding flight, but the edge is left in place awaiting the favorable trend to inflate again. I used to develop a gliding BICLA very old, with fishing rods of 4 meters each (crossbar) and the amount did pine in two tranches of 25mm section. The whole system is very light and fragile but perfectly satisfied with his work, that allowed me to do all the tests of inflation and that the glider can hold smooth structure and that it prevents the wing fold even with the edge crushed by the very low incidence. The aim was not to support the crossbar large negative charges, but prevents the wing configurations to adopt or take corbatas lot reopened. If the edge is in place, then the wing will take only a moment to return to normal flight, and so we can keep making bands B ears or even if it does not fill the crossbar size. That was another positive aspect of Paramontante, the crossbar must rigidificar 60% of the scale located at the center of the wing, the folded edge of the wing is not as serious. Ultimately the structure allows the wing to increase our strength by having the swelling does not depend so much of his career advancement, it is not necessary to drag the sail while the floor is not as important as the back of inflated Paramontante rise by well-armed the structure and development may be sufficient to bring the pilot to sail the shorter suspentaje, using leading edge as tight and smooth and the Hang Gliders, reduce suspentaje footage and many other advantages that go beyond what is easily lost amount of drag. Unfortunately this old BICLA not allowed me to make flight tests for its poor condition, but was able to verify that all performance in the floor of paramontante is perfectly viable and in flight it would be ... just make sure that the structure will bear either the effort required. I hope soon to make another Paramontante and to fly in turbulence and heat to finish his development. The big challenge is to demonstrate that it works and that the concept is feasible for the safety of pilots, but in reality the potential to reach Paramontante performances are well above the glider in sight. The Paramontante largely depends on the material to evolve, in the paragliding materials are taken to the limit and it is difficult to improve without jeopardizing the safety of pilots. become the " PARAMONTANTE II." laboratory where experiment the latest ideas. and now we are trying to improve the comfort and safety of use. 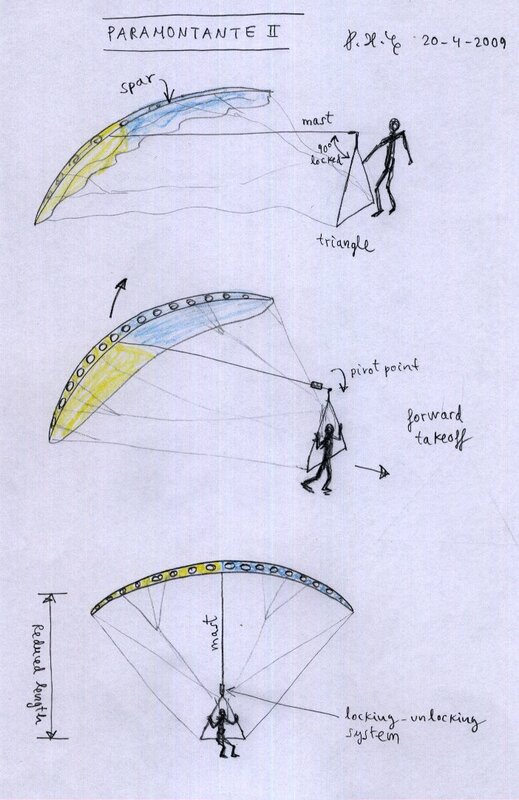 a new and fascinating hybrid hangglider-paraglider is born.